Not much has changed about Old Town Square in the last eight-hundred years. The square started off as a market place and it remains a market place today. But instead of selling to cobblers and farmers, the market place caters to tourists. During Christmas and Easter the square can take you back a couple hundred years. Little shops open up selling warm wine and classic Czech pastries. The smell of roasting chestnuts and sweet rolls permeate the entire square. Over the last eight-hundred years, a lot of great-looking buildings popped up around the square - some of the most famous in the world. 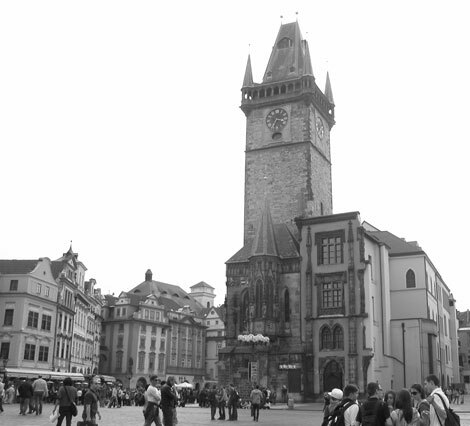 The astronomical clock and St. Nicholas Church are two of them. The most interesting is the history behind the large monument in the middle of the square. On October 31, 1517, Martin Luther nailed his The Ninety-Five Theses, widely regarded as the primary catalyst for the Protestant Reformation, at the door of the All Saints', the Castle Church, in Wittenberg, Germany. However, one hundred years earlier, Jan Hus was starting a protestant revolution of his own. Like Mr. Luther, Jan Hus was having a major issue with the Catholic Church, mainly the selling of indulgences. 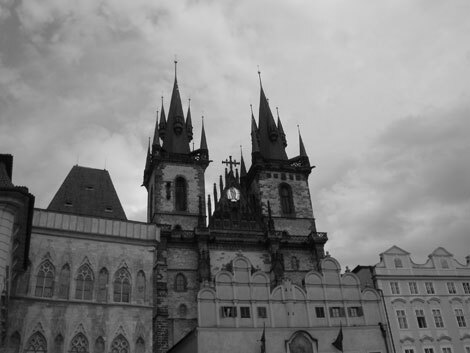 He started to preach to the Prague people who tended to agree with him. He was so successful that the Pope interdicted the whole city of Prague in 1414. This did not stop the bold Hus. He even continued spreading his ideas after his excommunication. Unfortunately, this really aggravated the Pope. Jan Hus was invited to The Council in Constance, where he was asked to kindly stop his preaching. Like any good revolutionary, he refused and the church was left with no other option than to burn him at the stake. His efforts and death were not in vain for it spurred up a bee’s nest of activity – mainly, the Hussite Wars. This bee in the Church’s bonnet caused havoc for many years. Crusades were sent to Prague to try to stop the uprising – all without success. The Hussites were determined and willing fighters, willing to fight and die for their cause. Unfortunately, this drive and determination turned inwards. The Hussite rebellion ended due to in-fighting. The church just sat back and watched them kill each other. Jan Hus was on the right track and he had a solid message to the world. But he was one hundred years before his time. It was not until Martin Luther had the same views a hundred years later that the protestant movement went global. The Jan Hus statue at the center of Old Town square is a monument to this visionary. He faces the Church of Our Lady Before Tyn, a popular meeting place for the Hussites. He is surrounded by warriors for the cause and people forced into submission and banished from the country for their views. Jan Hus’ main message was, “Love each other and wish the truth to everyone.” - Words worthy of a monument at the center of Prague. My first day in Prague I went to see Old Town Square. 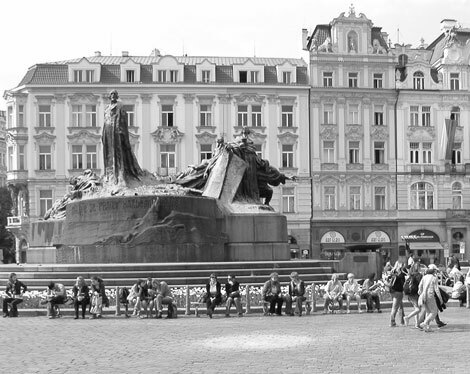 It is another one of those spots in Prague that a tourist must visit – a big square with a statue in the middle. And all four sides of the square are lined with tall old buildings. At night the statue and churches are lit up and it looks quite impressive. If it were not for all the tourists talking loud and the camera flashes, you could imagine yourself back in time, a time of kings, priests and cobblers. You can easily spend half a day in the square itself. It takes only a few minutes to look around and see all the buildings, but to capture the essence of the place you need to sit down. You can sit at one of the many restaurants or cafes in the square, but I wouldn't. In the summer most of the tables are covered by a large umbrella. So you come all the way to Prague, right to heart, Old Town Square, and then you sit under an umbrella – reading the beer advertisement. I prefer to get a coffee or ice cream from one of the shops, and then relax quietly at the statue in the middle of the square, getting the proper mix of the majestic buildings and the people scuffling about in front of me – coming and going from all directions. The Astronomic Clock is one of the clichéd postcard pictures. I am not sure exactly how it works. It has many dials all overlapping each other with lots of numbers, names and symbols. The clock has a very distinct cuckoo bird. Typically, every hour, magic is performed - people gather around the clock and await the show – cameras ready. I must admit that I was disappointed. No big sounds, no explosions or bright lights, just a few statues that shake and nod. If you are used to shows at Las Vegas and then you come to see the astronomical clock you are bound to be disappointed. But I guess the wonder of it is not in the sights and sounds, but in the fact that it was created hundreds of years ago and still works. I have never gone into most of the buildings surrounding the square. The only building I went into is the big church – because it is cool in the summer – and because it really is big. Upon entering from the outside, you are suddenly in a completely different place. Outside it is hot and there are crowds of people. Step inside the church and it is suddenly cool, dark, quiet and somber, tall ceilings, Renaissance paintings of the Lord and his many earthly friends. It is hard to think about the real world once you step inside a church of such grandness. You begin to think about the “big picture”. While standing at the square, the natural inclination is to look up at the tall buildings. For my first year in Prague this is what I did, until one day a friend told me to look down. I found myself standing on the Prague Meridian. From 1650-1918, a large column, one of the oldest columns in Europe, stood in the square. Every day at twelve noon it would cast its shadow on a certain section of the square. This was the meridian used to verify the exact solar time. The column is gone now and so is its shadow. But you can still see in the paving of the square where the noon shadow was cast. As you try to read the Latin inscription, think about this: The great column did not fall due to old age and neglect; it fell because people tore it down. In a fervent revolutionary excitement a group of narrow-minded folks understood it as a symbol of Hapsburg rule and took it down out of pride - their ignorance, our loss.